XLOR8T I think you will find J.Ho's answer to your question below exactly what you were looking for. I also want to reiterate the fact that our Sport Catalytic Converters for this car are covered by an industry leading 3 Year warranty against check engine lights or other deficiencies of the HJS catalytic converter. Looking great, Jeff! 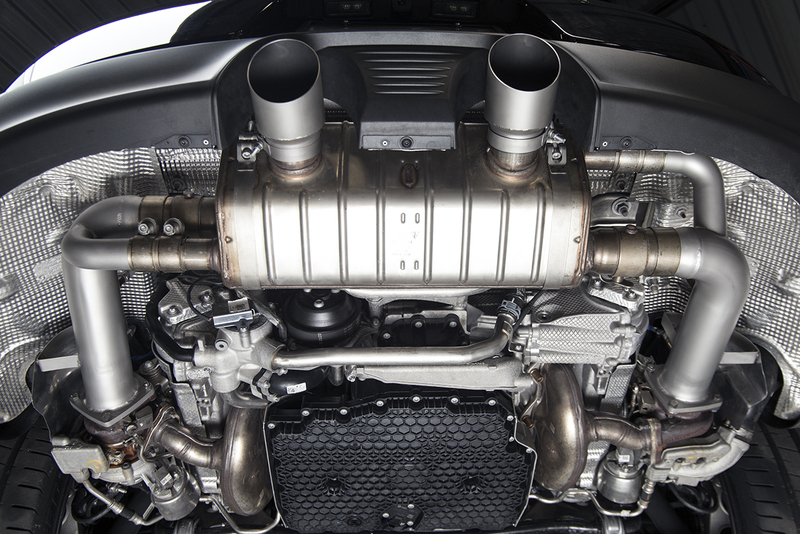 We agree with you, the Sport Catalytic Converters are the perfect one stop shop for the 991.2 with PSE. Nice improvements in sound, power and response all in an easily reversible upgrade. 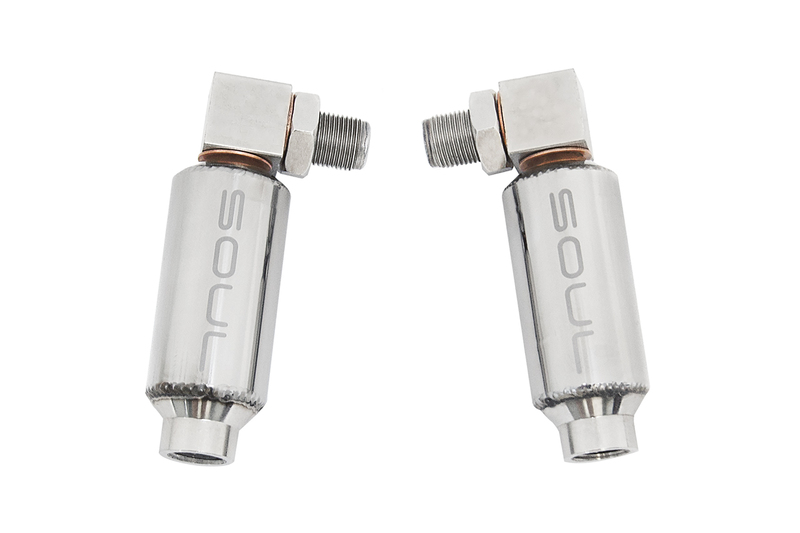 Available now - two high performance replacement options for the restrictive factory catalysts. + The directional HJS HD 200 cell catalytic converters are appropriately sized for the power level of the 991.2 Carrera, well in the range of the greater advertised power gains that we’ve seen with tunes as well. The flow path is optimized to utilize the entirety of the catalysts for proper exhaust scrubbing, resulting in no check engine lights. 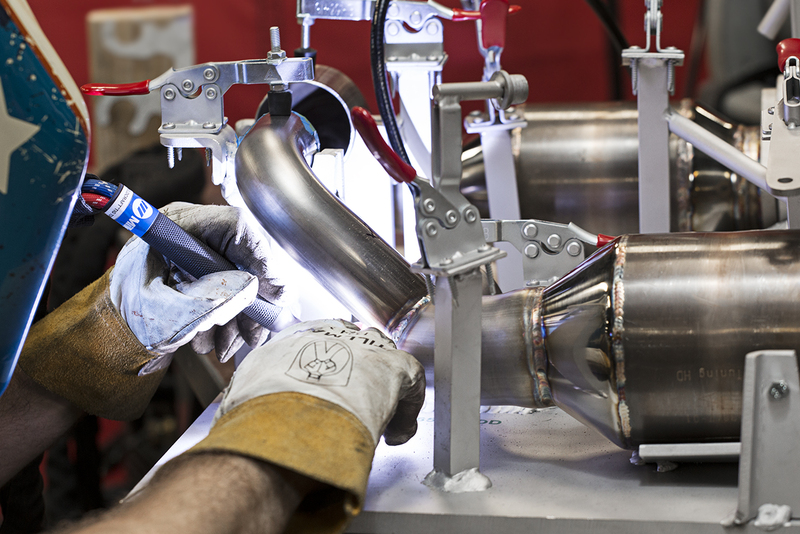 + We felt it important to retain use of the factory heat shields as to not heat soak the components around the turbos. + During the fabrication process we back purge as many welds as possible for maximum durability and then hand apply our signature satin finish for a perfect, uniform look. Should you ever remove your components at any point and would like them refreshed, we’ll refinish them for a reasonable fee. + During testing we experienced no CEL with Cat Bypass Pipes, but cannot guarantee the same results on all cars as all cars are different and unique. Catted O2 Spacers are available to reduce any chances of triggering a CEL. 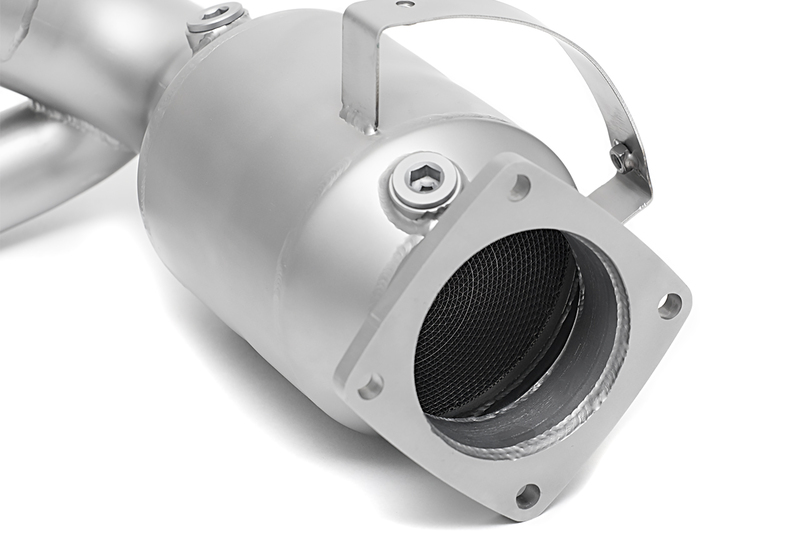 + We designed our Cat Bypass Pipes to have a straight through exhaust path with valves open in pursuit of maximum exhaust flow and power - if you’re deleting catalysts that is surely your focus! We’ve positioned the secondary tube into the Porsche Sport Exhaust where it is to keep the valves closed tone civil and refined while still receiving ample exhaust flow. Sound is subjective, but we’ll do our best to explain our experience so far. Both components accentuate the sound of the engine - you can expect more flat six growl. Love it or hate it, both components will also increase the presence of the turbos - with Cat Bypass Pipes allowing the turbos howl a bit more during deceleration and reach a more distinct wail on acceleration. The Sport Catalytic Converters are perfect for the daily driven car as there is no added drone and the volume level is refined. Mike: “When we swapped back to Sport Cats I missed the extra sound the Cat Bypass Pipes added, but then again I like my cars as sporty as possible. 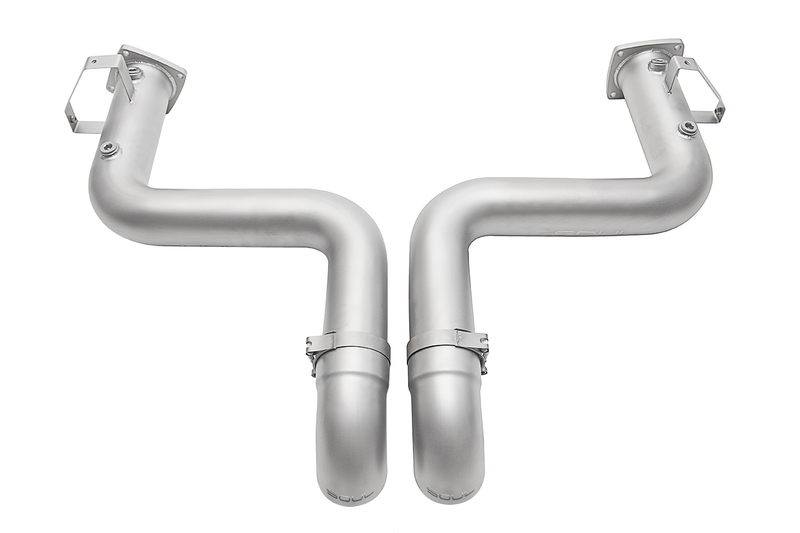 If you like an aggressive exhaust tone - Cat Bypass Pipes are perfect. I enjoy the extra volume in the cabin and don’t mind it at any RPM, valves open or closed. 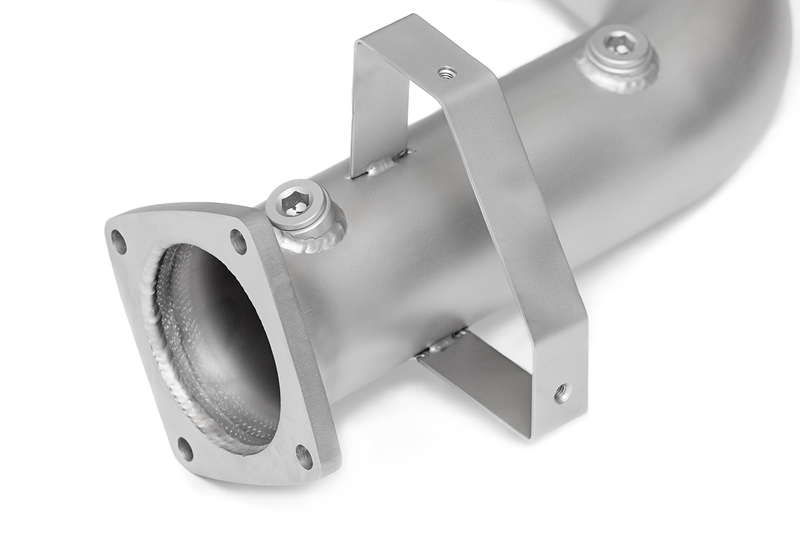 Sport Catalytic Converters and Cat Bypass Pipes are available now. Contact us to order, visit our 991.2 website section here, or let us help you find your nearest dealer / installer. 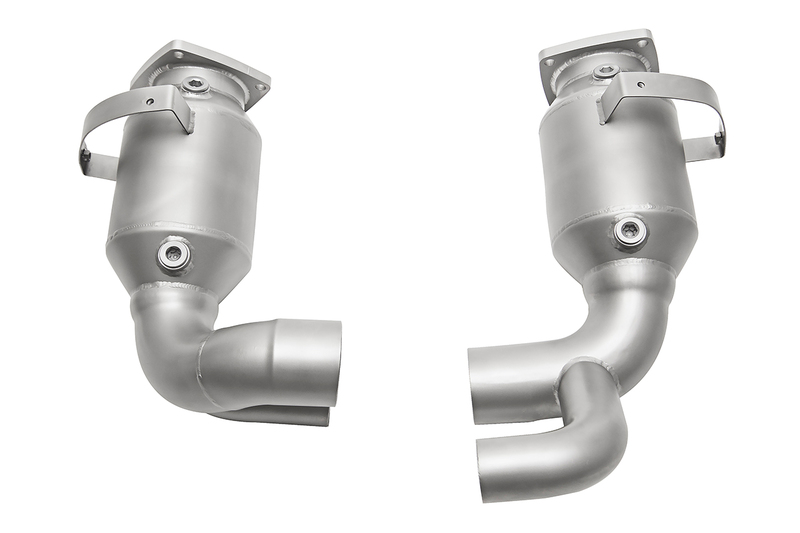 Our Trackback turbo back exhaust will be available soon. Last edited by Soul Performance; 07-27-2017 at 03:20 PM. I'm pretty much NA till I die, but that is a fine-sounding 991.2. I still think the overrun noises sound like it's broken though. Wonder if they can be programmed out, or in more, with a tune. My vote would be for more! Thank you! It's no screaming GT4 but definitely delicious in its own right. The extra noise on overun occurs in Sport mode - you don't hear them nearly as much if at all in Sport Plus mode. I imagine a skilled tuner could adjust the overrun, might be worth a call to GIAC or COBB! Wait until you hear the video of the Trackback exhaust! Awesome! Are these currently in stock or is there a lead time for fabrication? Thank you! We are good in stock on the Sport Catalytic Converters, but will have Cat Bypass Pipes squared away by the end of next week. Our prototype CBP was made up of two pipes and we've ironed out the bend profile for the mandrel bender so that it will all be one piece. We can build the two piece design easily in a day right now, but we'd rather our customers have the best product. We will have both on the shelf at all times moving forward! Great! I'm hoping fitment on the 991.2 GTS should be ok? Turbos are larger but the turbo inlets/outlets seem to be the same as the standard Carrera and Carrera S? The fitment will be a bolt on replacement for the OEM catalytic converters with no modification needed! 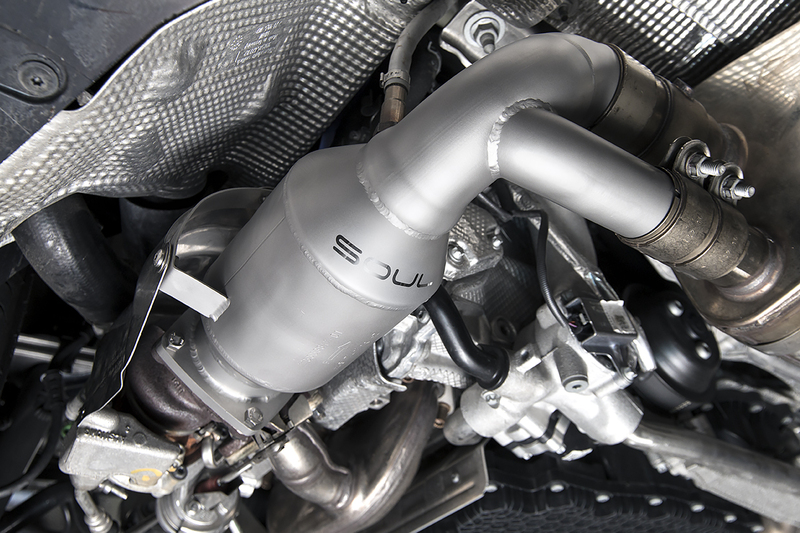 I can't wait to hear the larger turbos of the GTS with our Sport Catalytic Converters! Alright! As long as it's in stock currently gonna go ahead and place an order on the website! Check your PM's - I will be following up with a Rennlist member specific coupon code and thank you for your order! Can't wait to hear what you think of what you hear! Anyone interested in a set of our Bolt On Exhaust Tips will be happy to know that we've lowered the pricing. We've optimized our manufacturing processes (working in larger quantities and utilizing better machinery) and decided to carry over the reduction in costs into savings for our customers. We'll also have 4" versions available very soon! I went out of town and had my Soul performance exhaust while I was gone. Paired the exhaust key with the homelink which is really cool. Obviously having a button on the center console would be the best. First impressions just from starting the car is WOW! The prior standard exhaust was far to timid on start up. This sounds like a real sports car now. I think it's going to take a day or two to get used to the sound. Almost too loud at 3-4K rpm but I'll have a better perspective in a few days. The sound of the exhaust is amazing at full throttle. When the valves are closed and not in sport mode it's well behaved. Right now the tips seem too far out but I'll reassess in a few days. I love the slanted tips. They almost have a golden hue. The installer said the product was very good quality. I'll take some better pics and give some more thoughts after I've had it a few days. 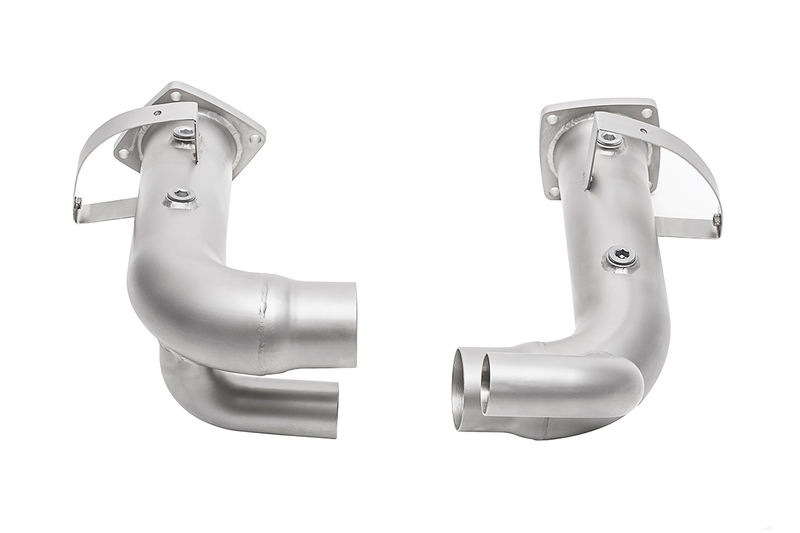 Unleash the full growl of the 3.0L flat six and hear the twin turbos sing in all their glory with a straight dual 3″ system from the turbos back - the Soul Performance Products Trackback Turbo Back Exhaust. As mentioned earlier we experimented with a straight pipe system. Not only does it sound incredible, but it makes good power as well. This setup weighs 27 lbs / 12.2 kg less than factory exhaust components (39 lbs vs 12 lbs) making it perfect for track days. 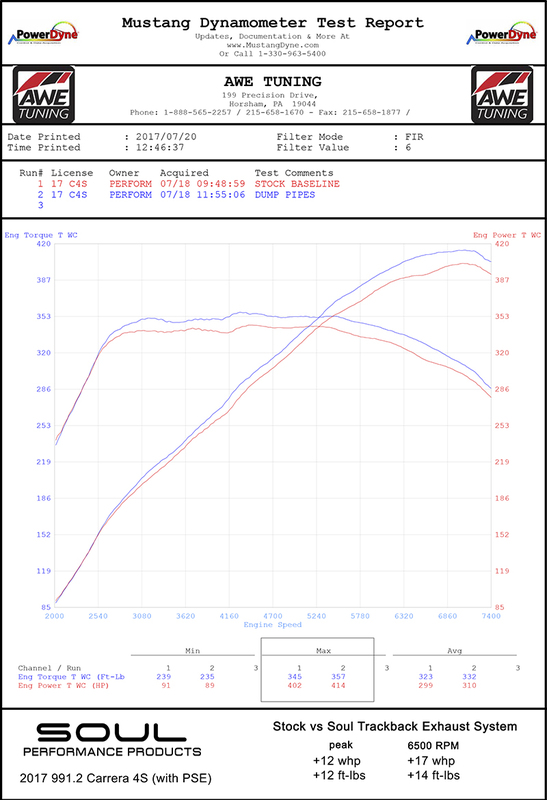 We've optimized the turbo heat shield bracket a bit further as seen below. During testing we experienced no CEL, but cannot guarantee the same results on all cars as all cars are different and unique. Catted O2 Spacers are also available to reduce any chances of triggering a CEL. That wraps up our development for the 991.2 with PSE. Next up - Base and S models without PSE. If you'd like to be involved in the development process, please get in touch!